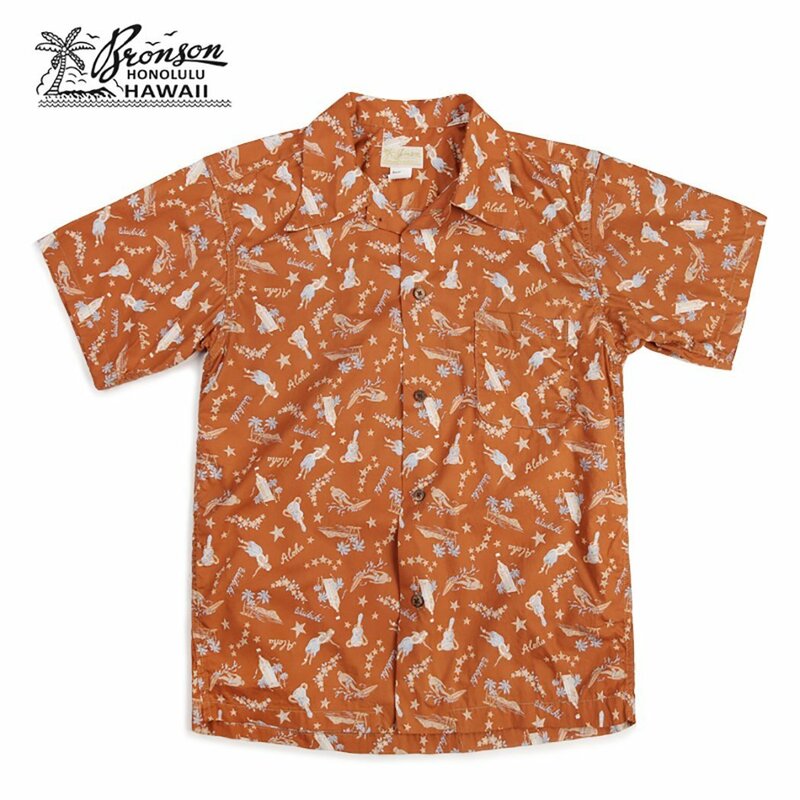 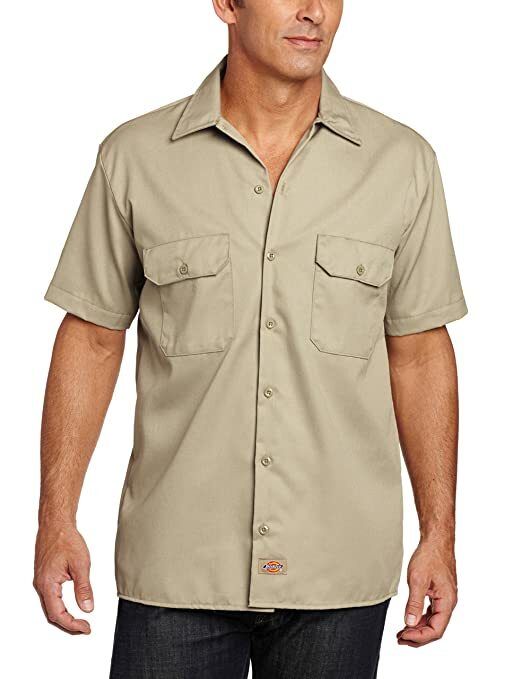 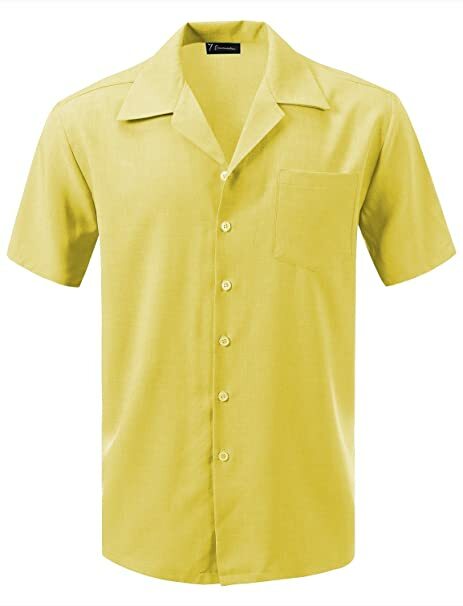 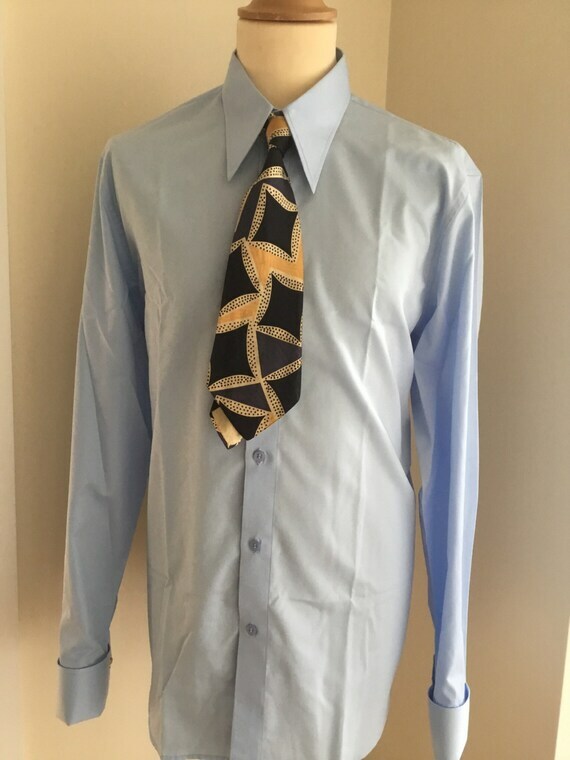 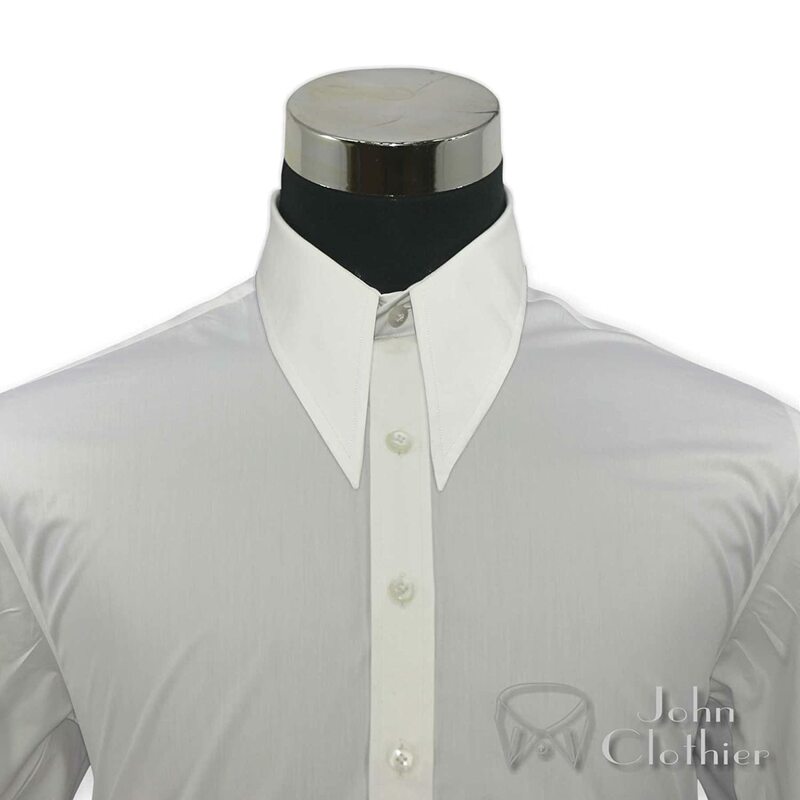 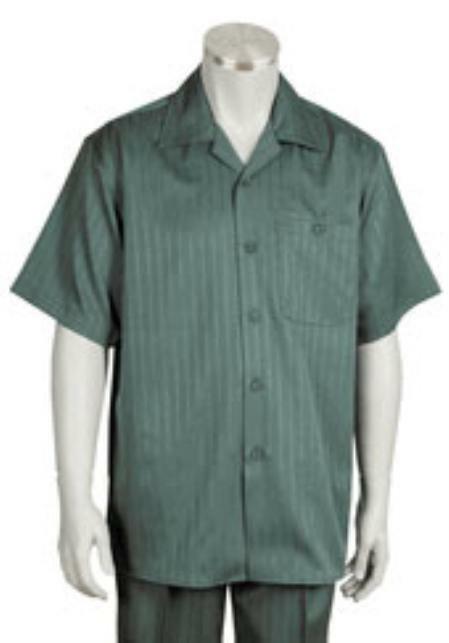 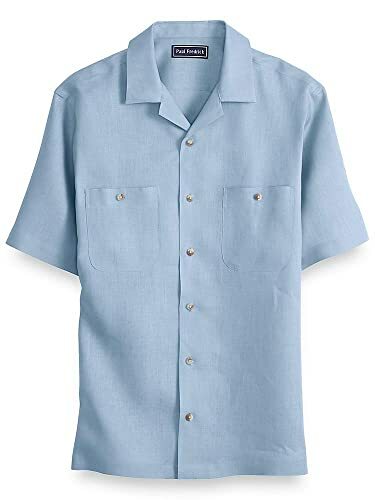 1940s men’s shirts, both casual and dress shirts, were solid colors with classic pointed, spread or spearpoint collars that were both wide and long. 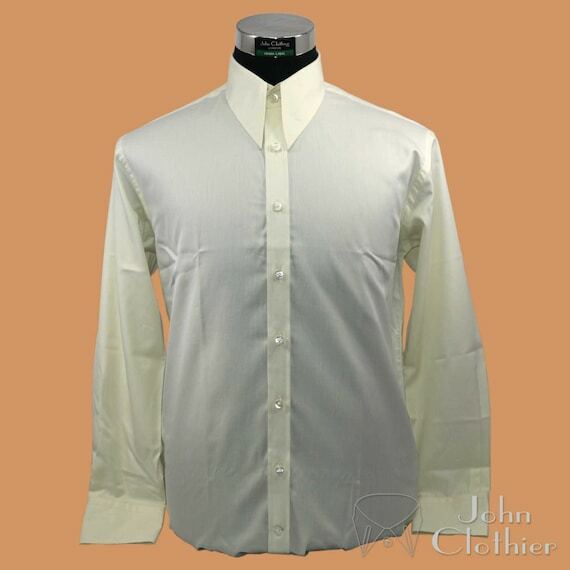 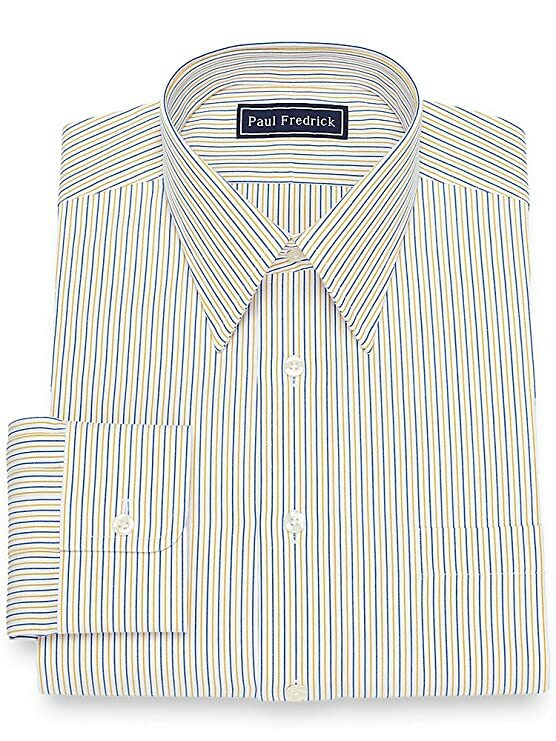 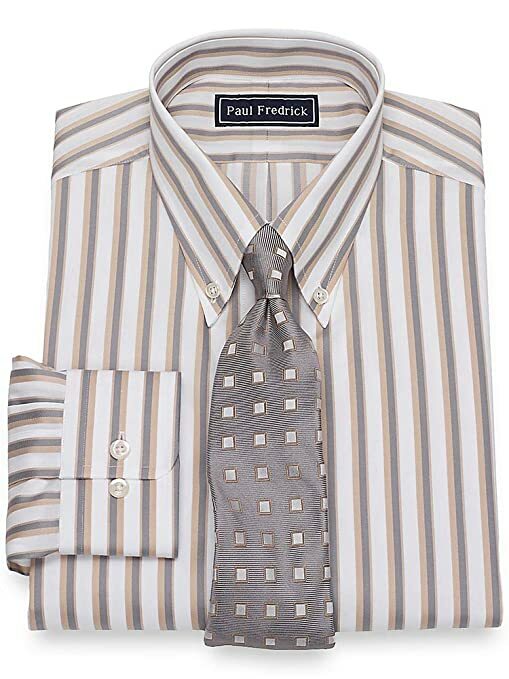 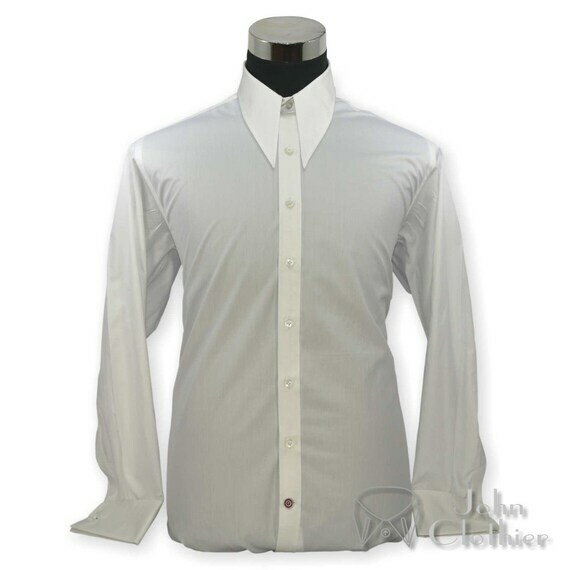 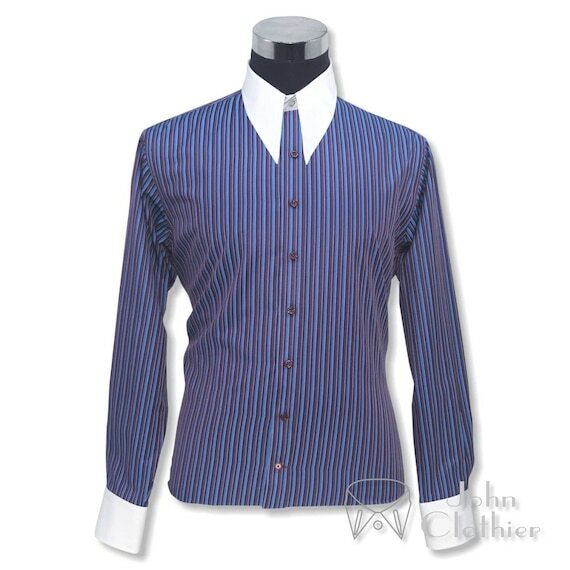 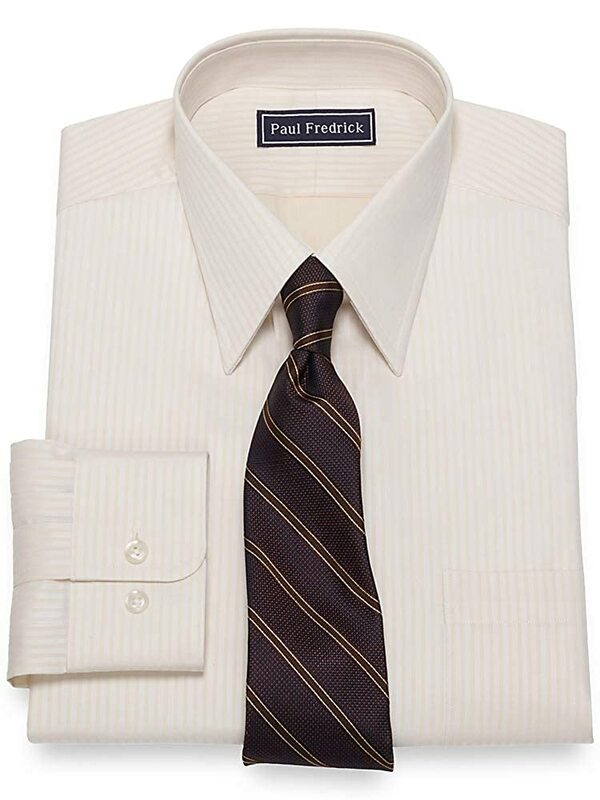 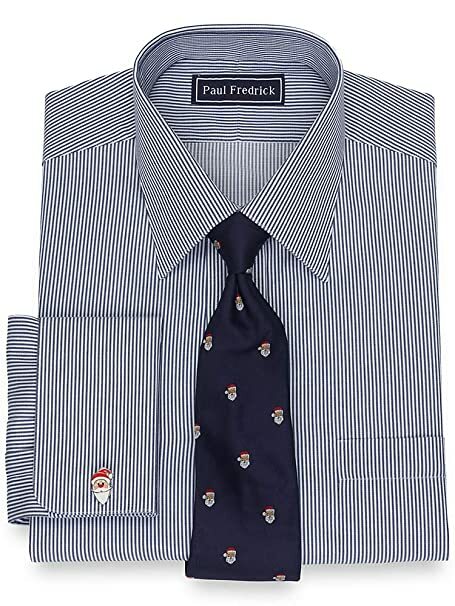 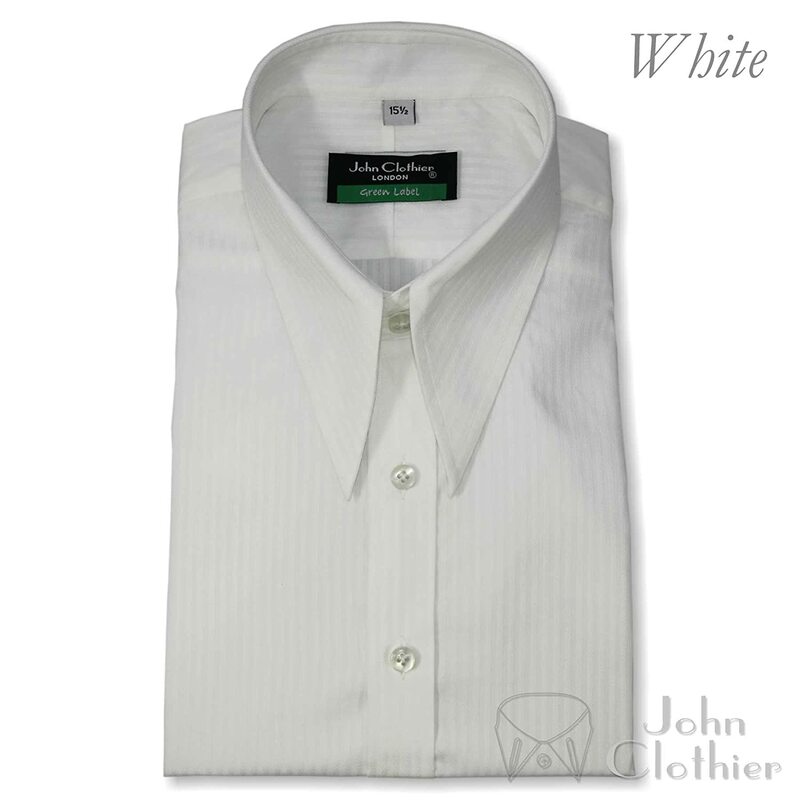 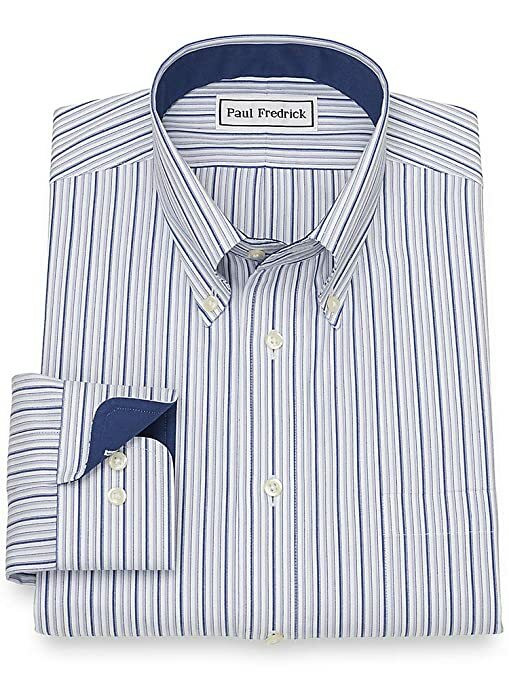 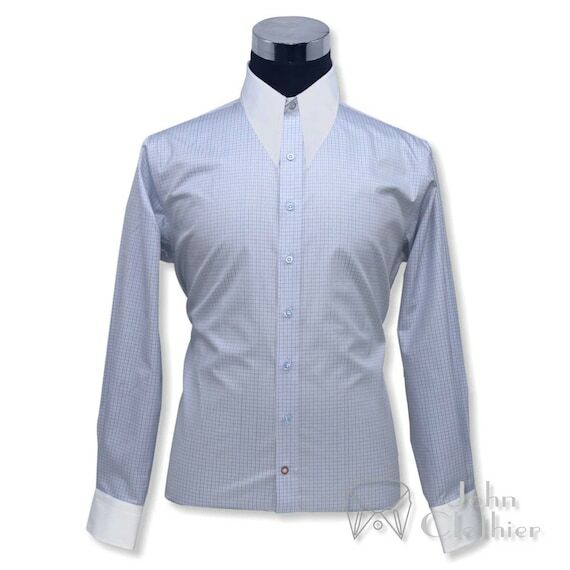 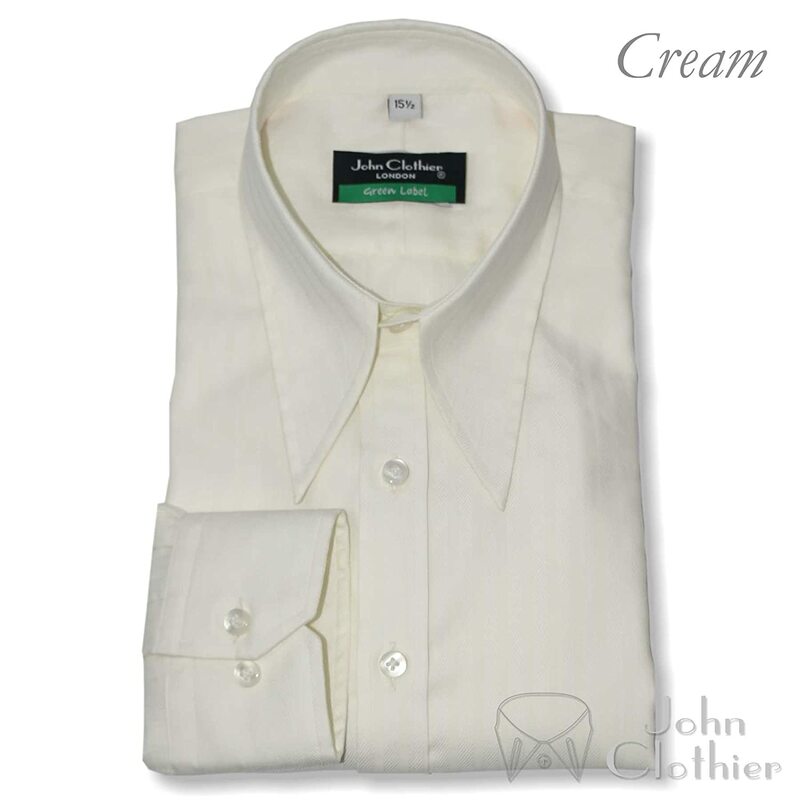 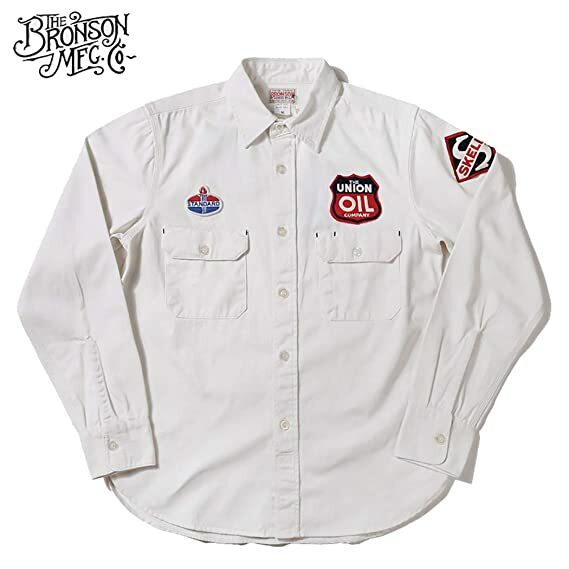 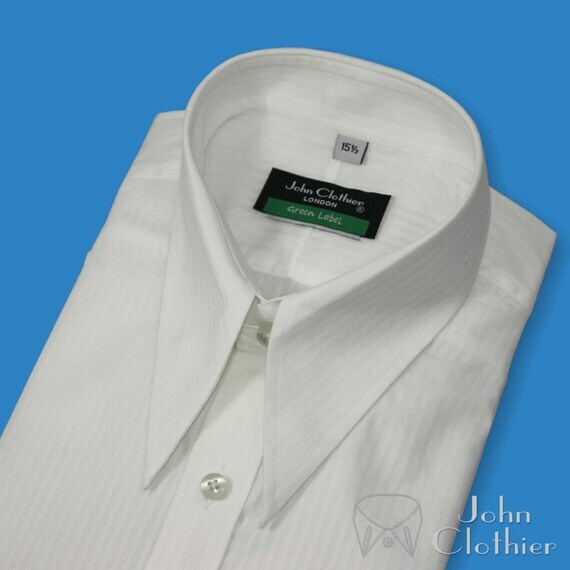 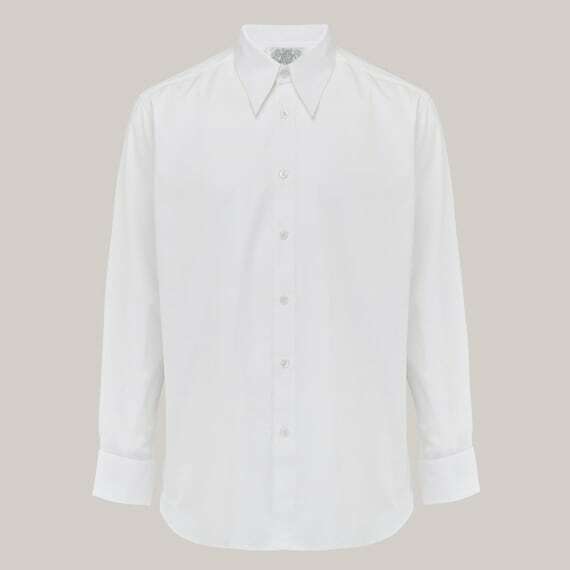 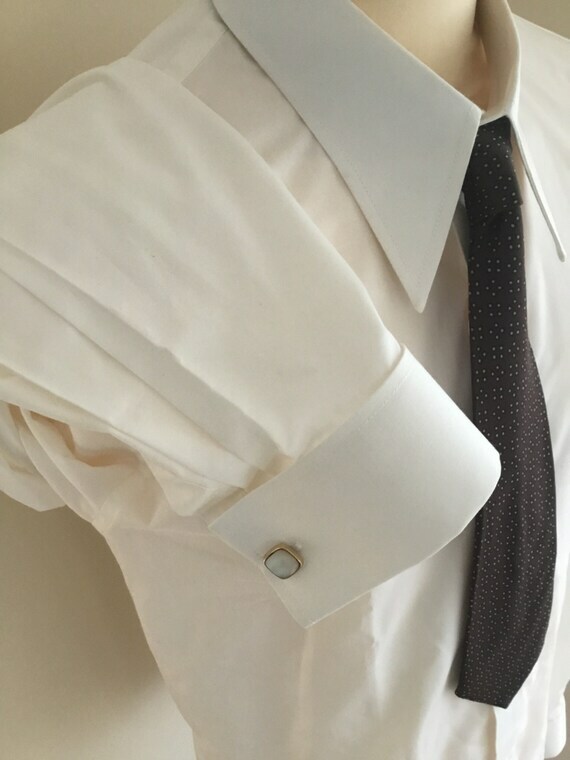 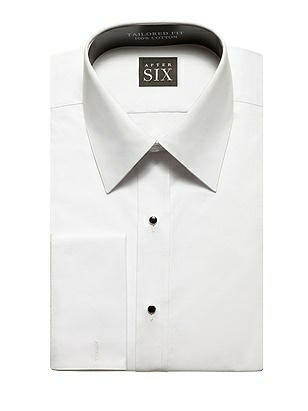 Button down shirts fit loose with french cuffs on men’s business shirts. Common colors were white, cream, blue, pink, green, and tan. 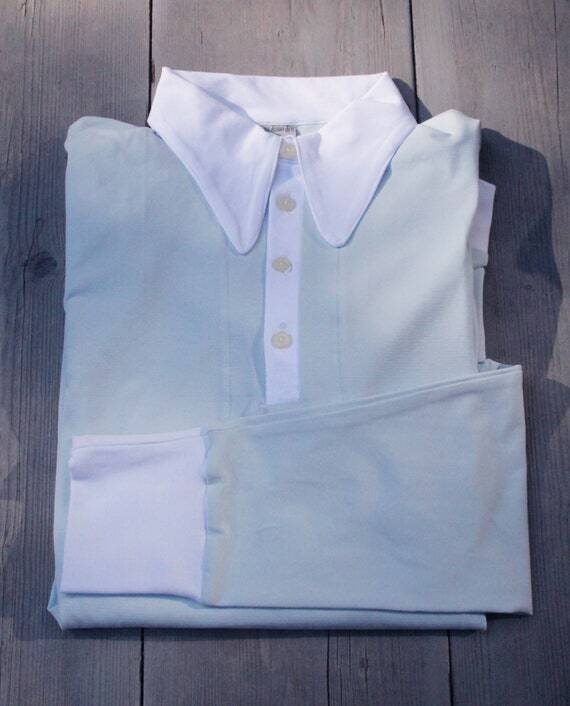 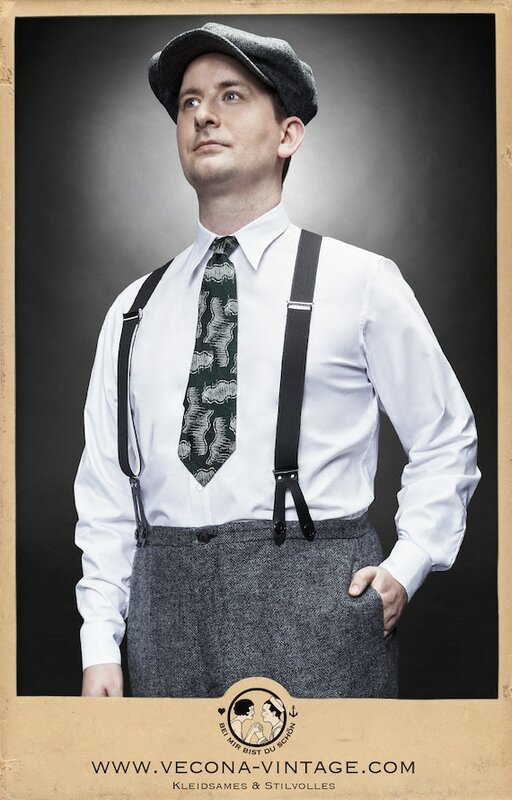 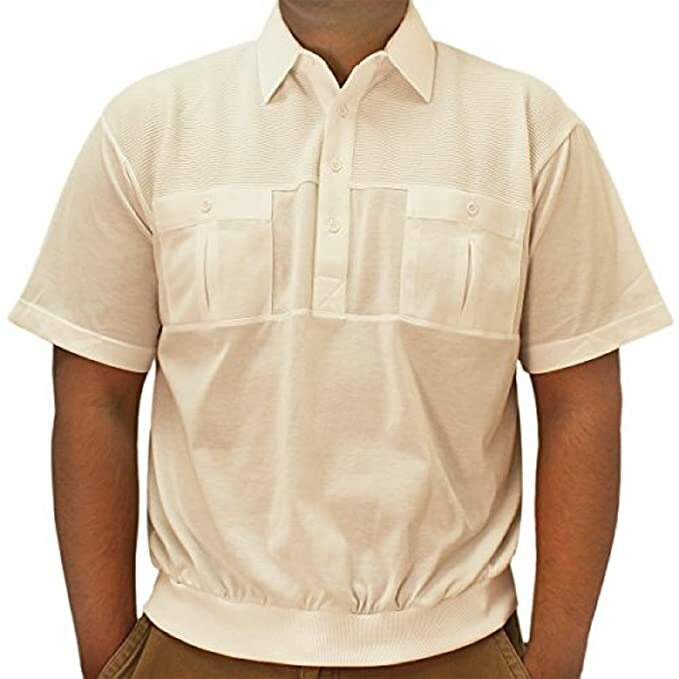 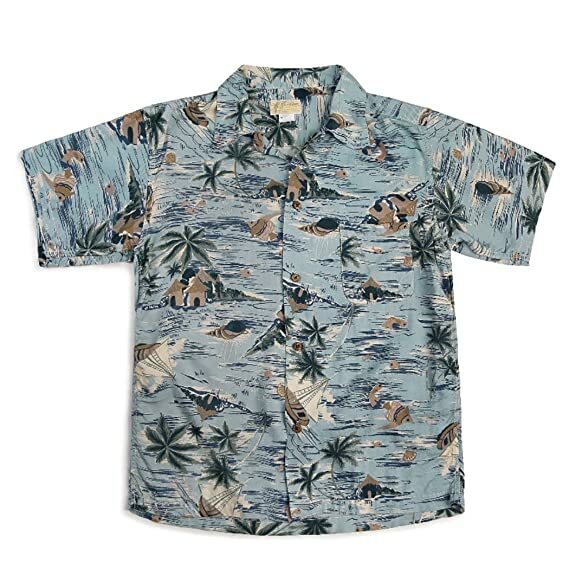 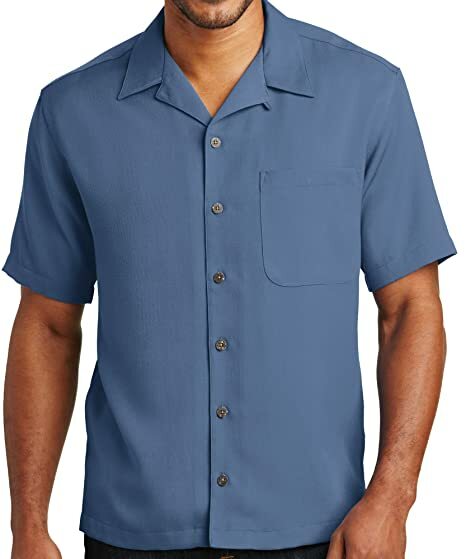 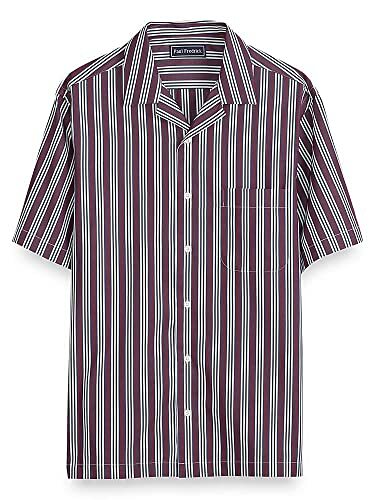 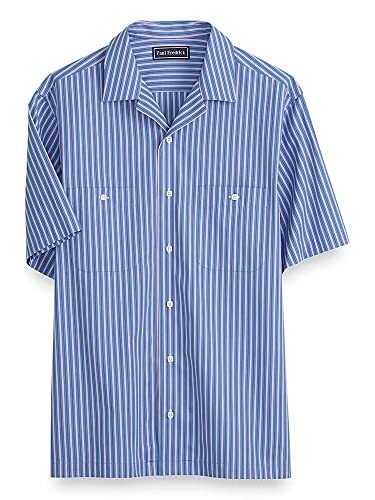 While men’s 40s dress shirts had one pocket, casual sports shirts had one or two chest pockets and a large open collar. 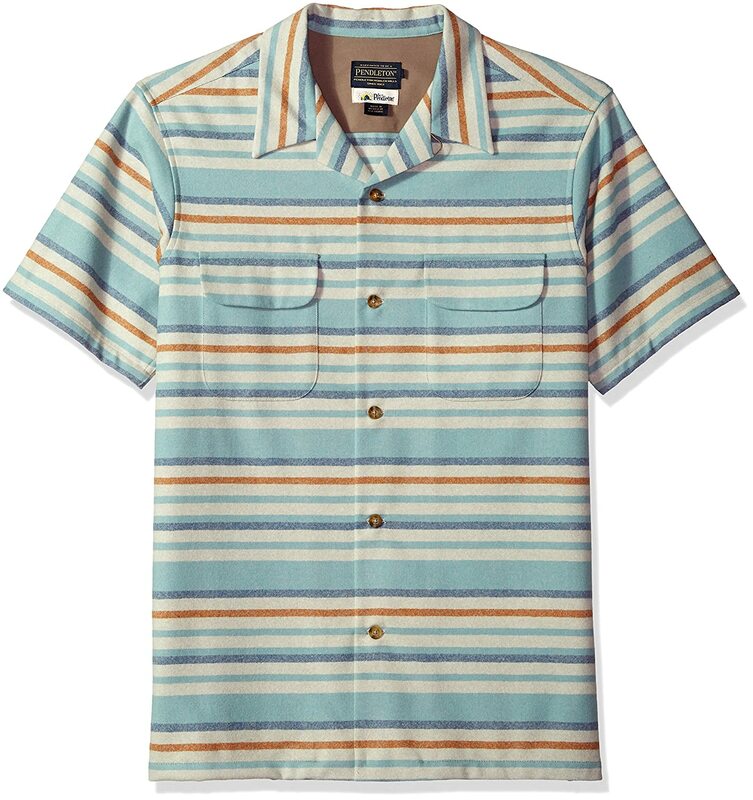 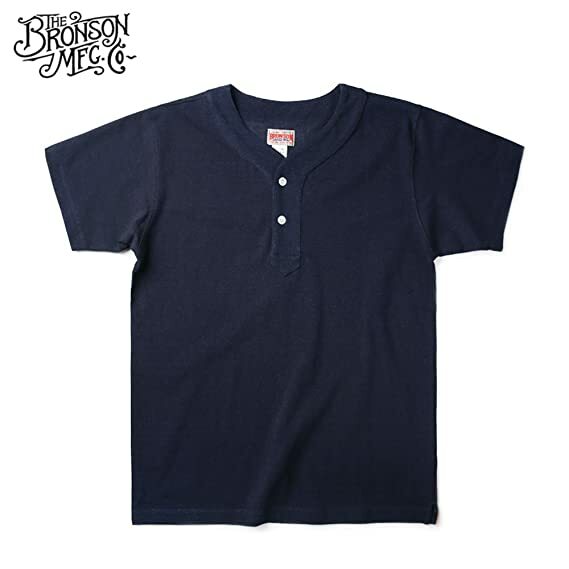 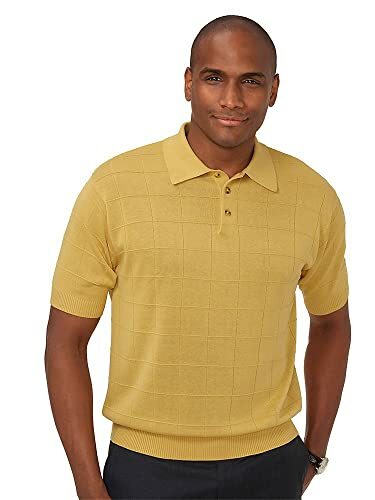 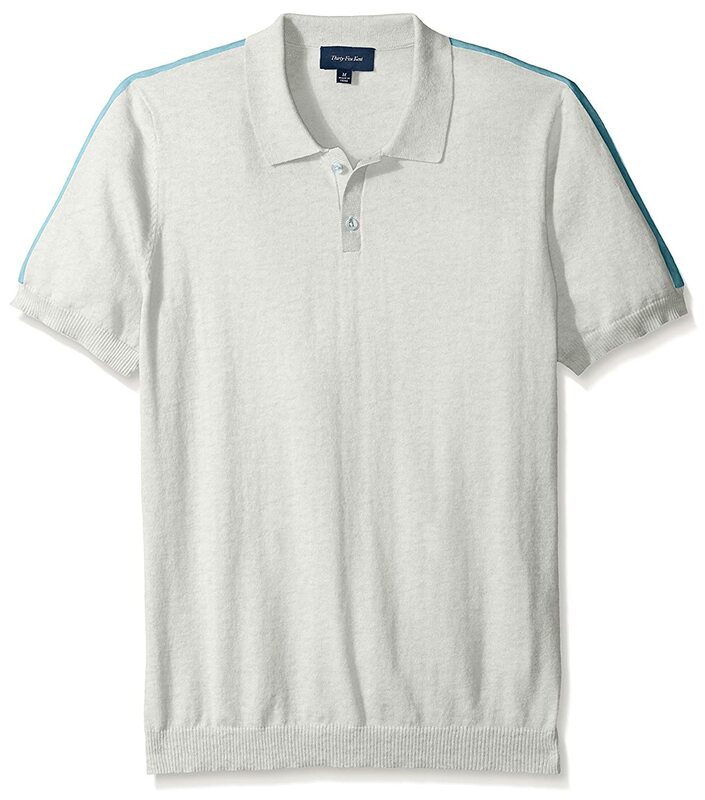 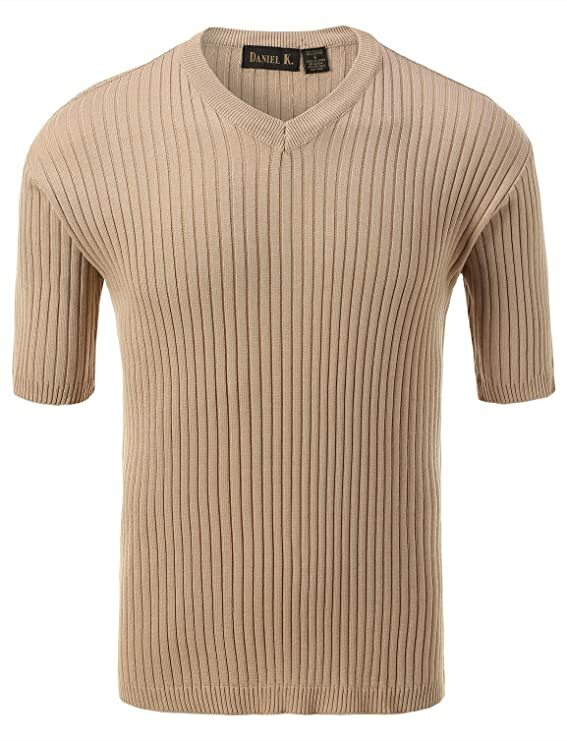 Knit sport shirts were similar to polo shirts but with a ribbed band at the bottom and sometimes sleeves were popular with college kids and athletes. 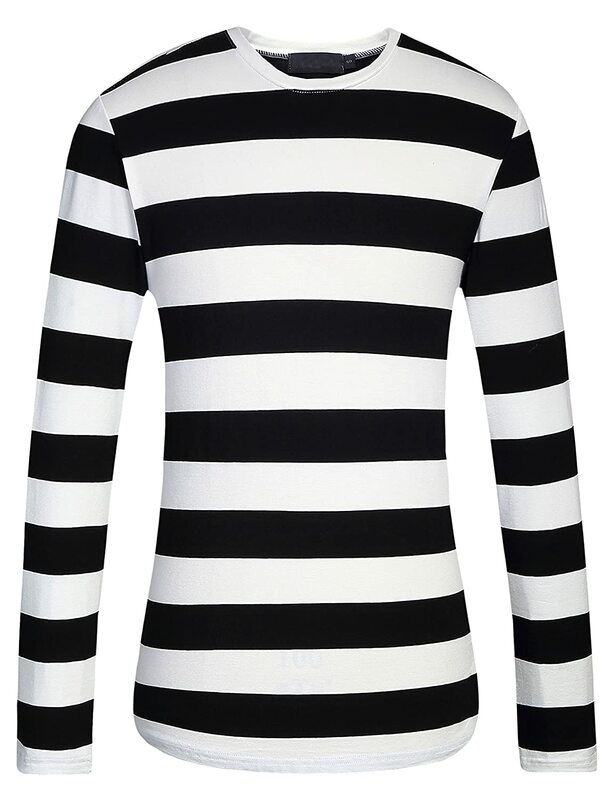 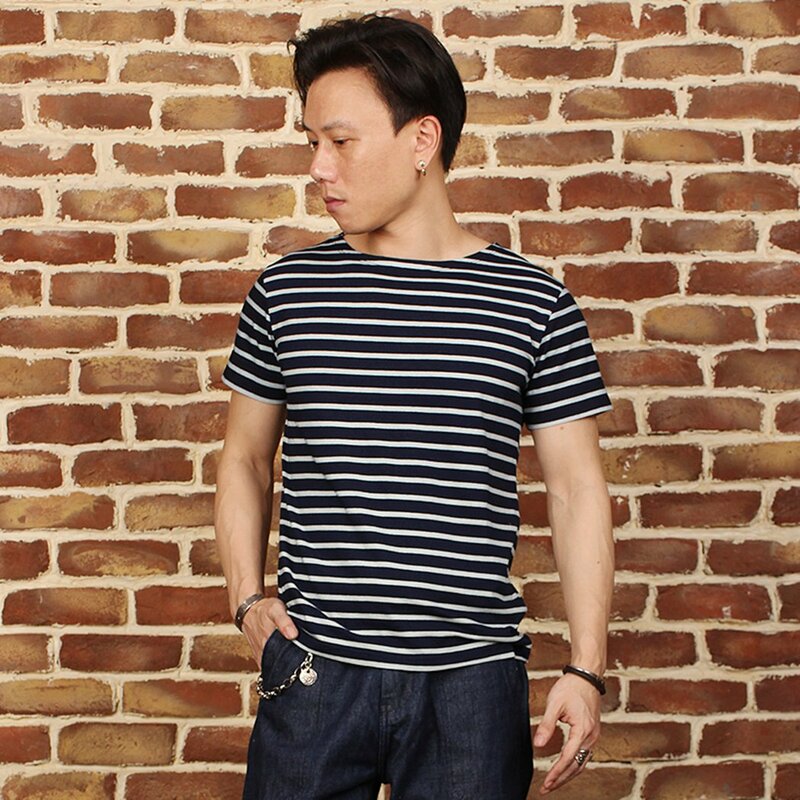 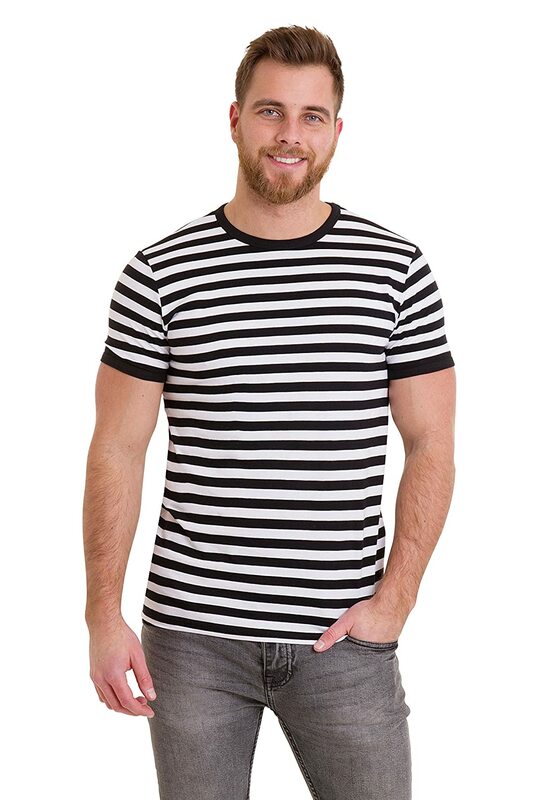 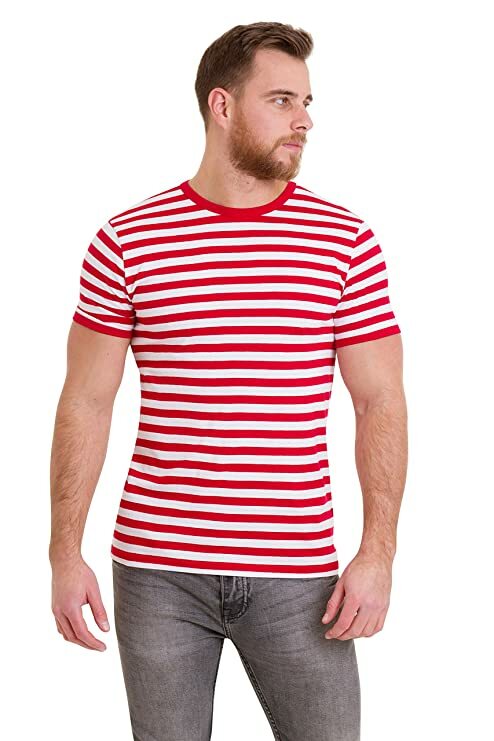 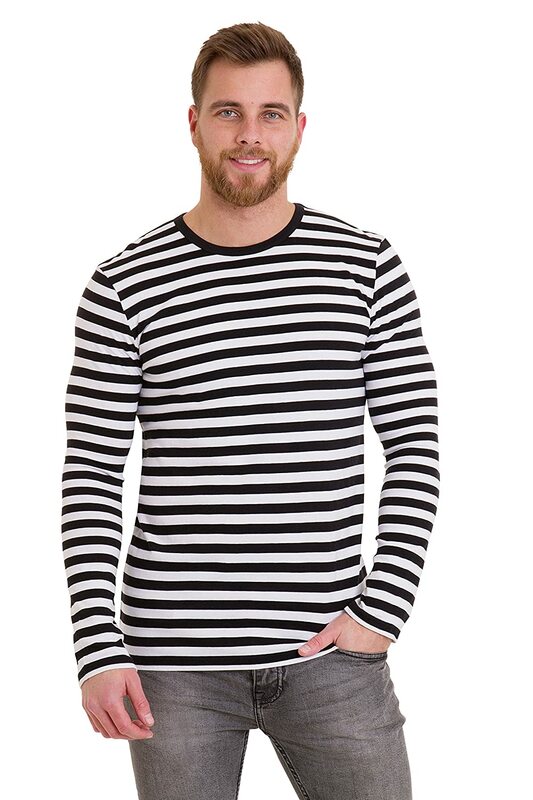 The T-shirt was a ringer crew neck shirt in white or horizontal stripes. 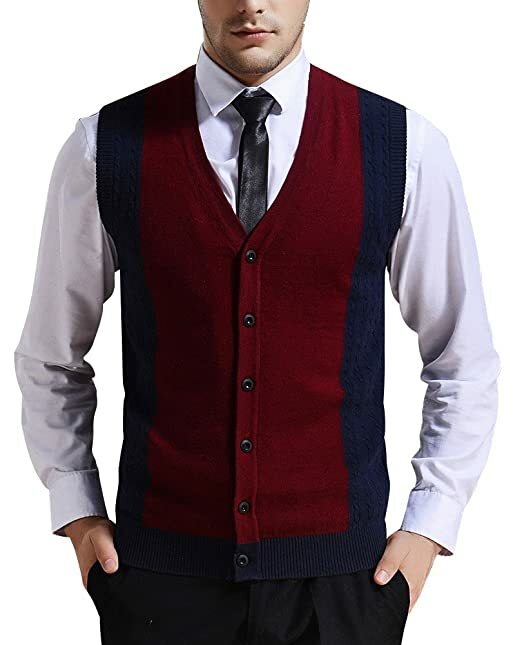 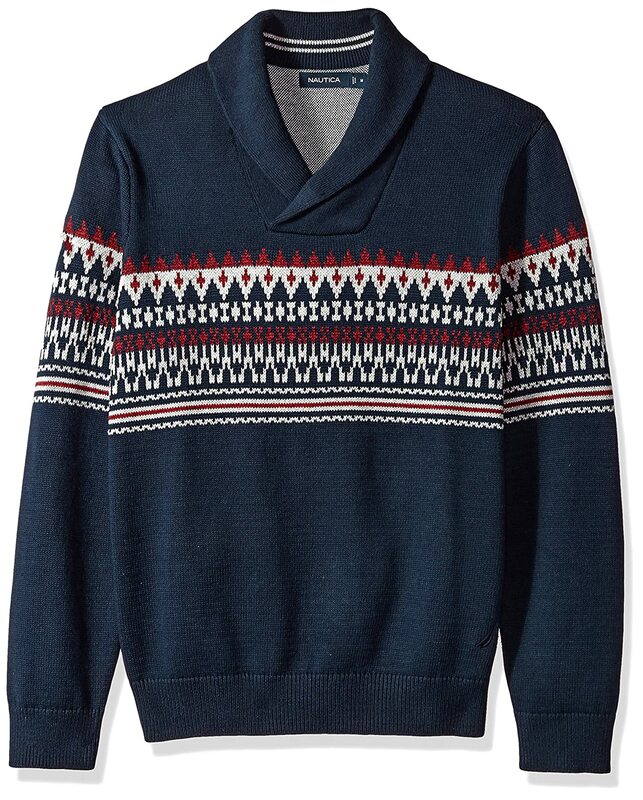 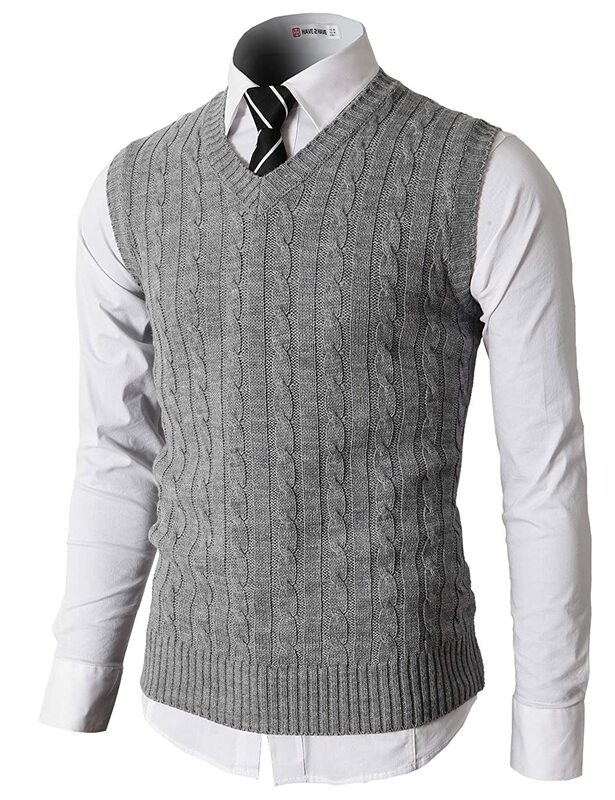 1940s men’s sweaters and cardigans were another semi-casual fashion item that could be worn over a dress shirt and tie alone or layered under a sportcoat. 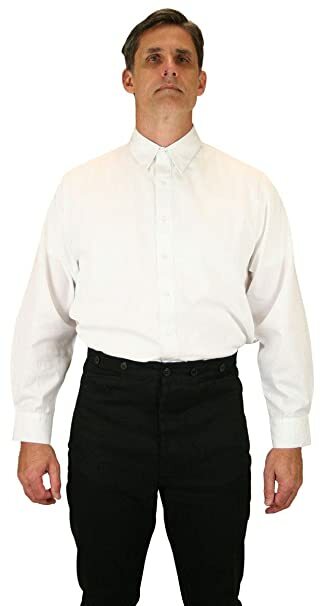 Because pants were high waisted sweaters were short with wide ribbed hems. 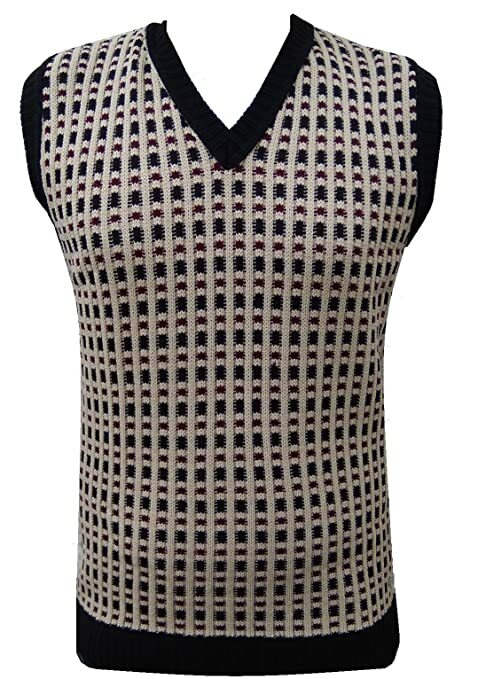 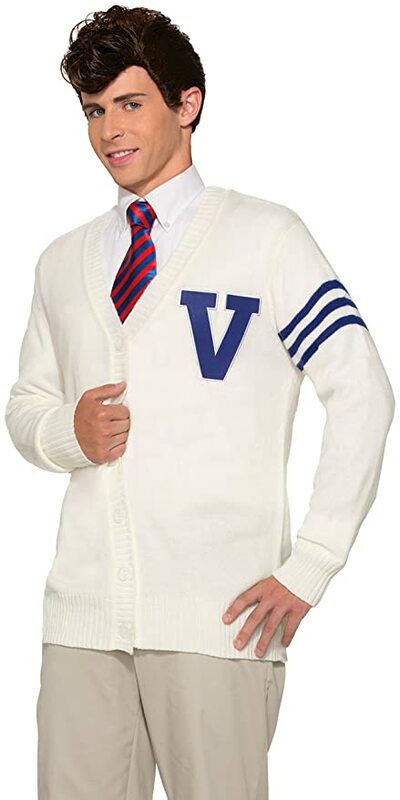 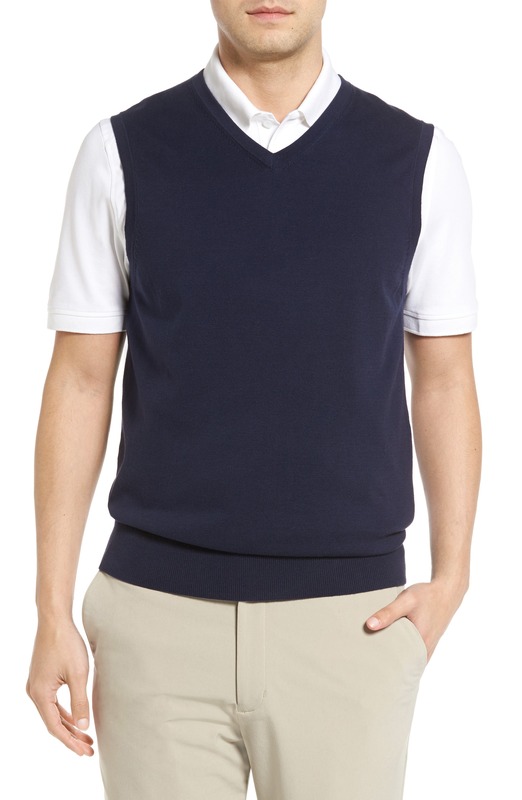 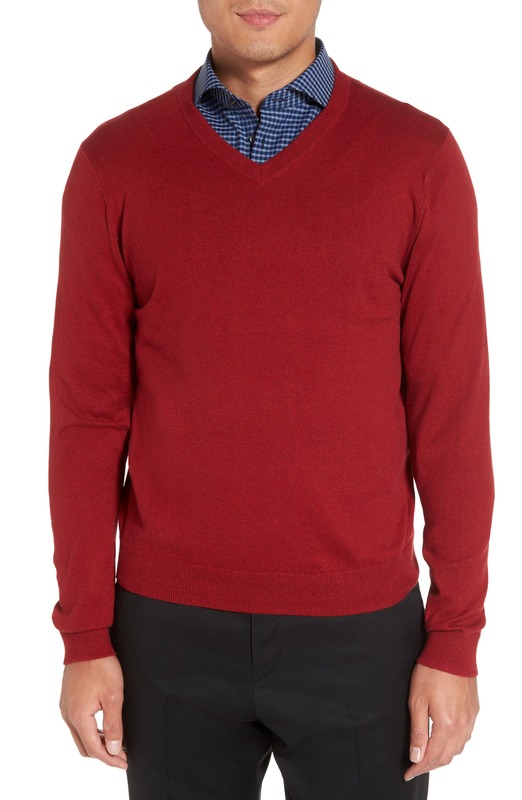 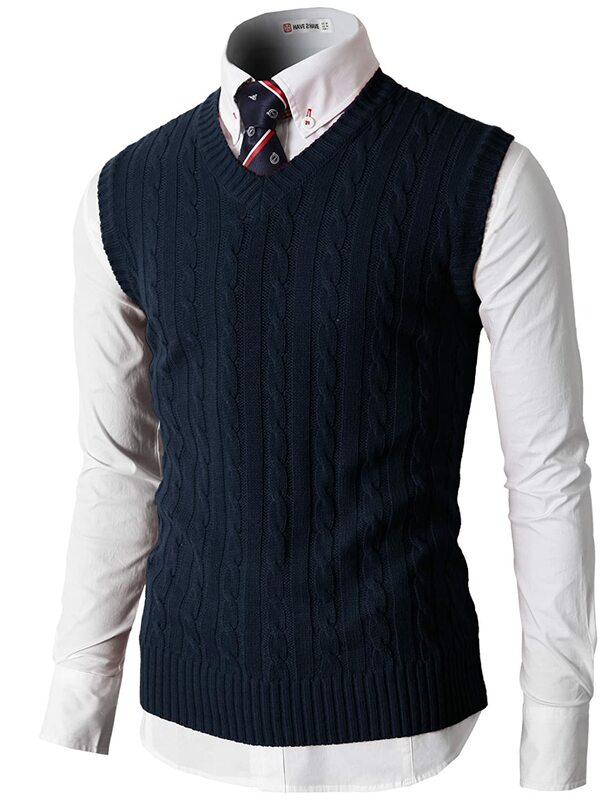 V-neck sweaters and sweater vests were the most common in solid tan, blue, navy, grey and burgundy. 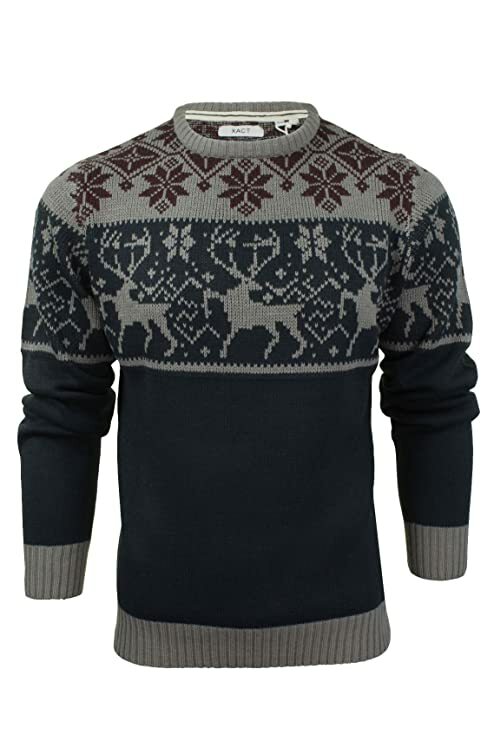 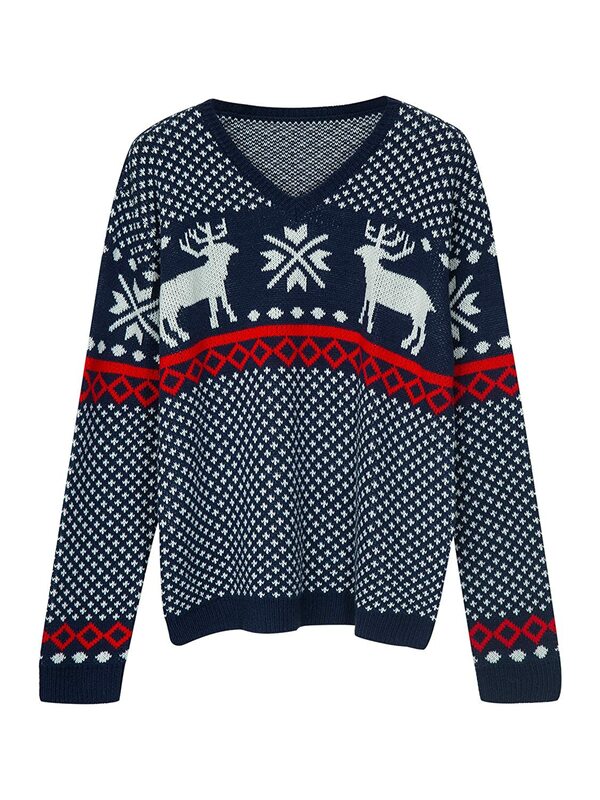 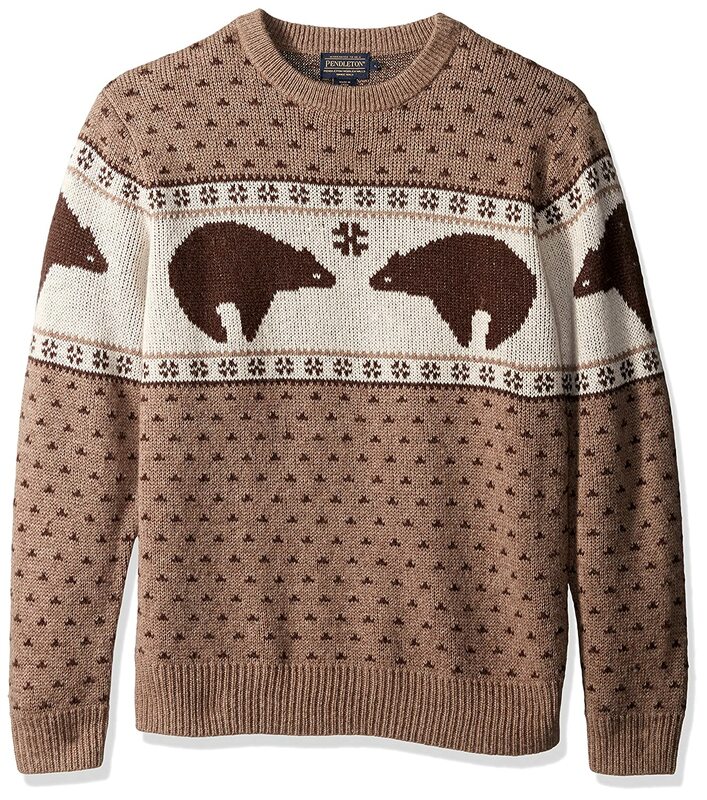 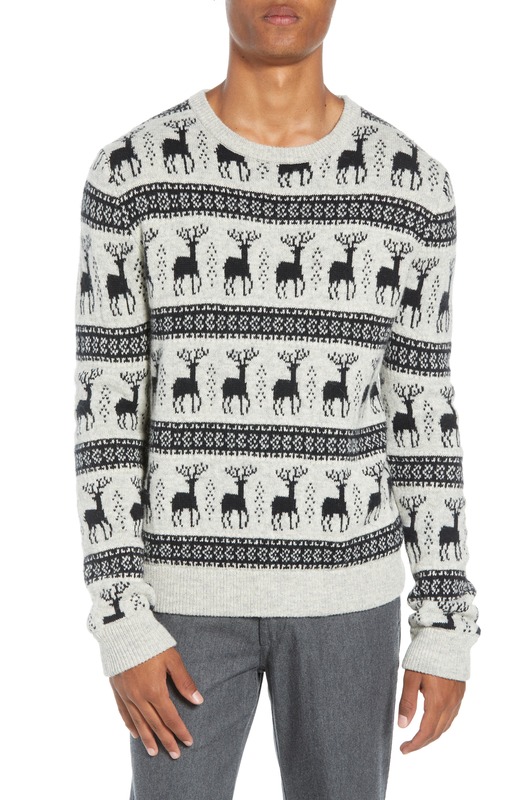 In winter fair isle and other nordic wintery prints and novelty animals (deer, squirrels, birds) add festive patterns to an otherwise plain look. 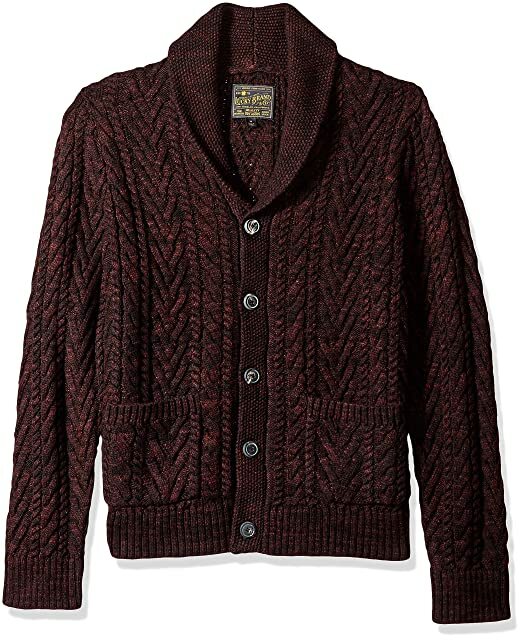 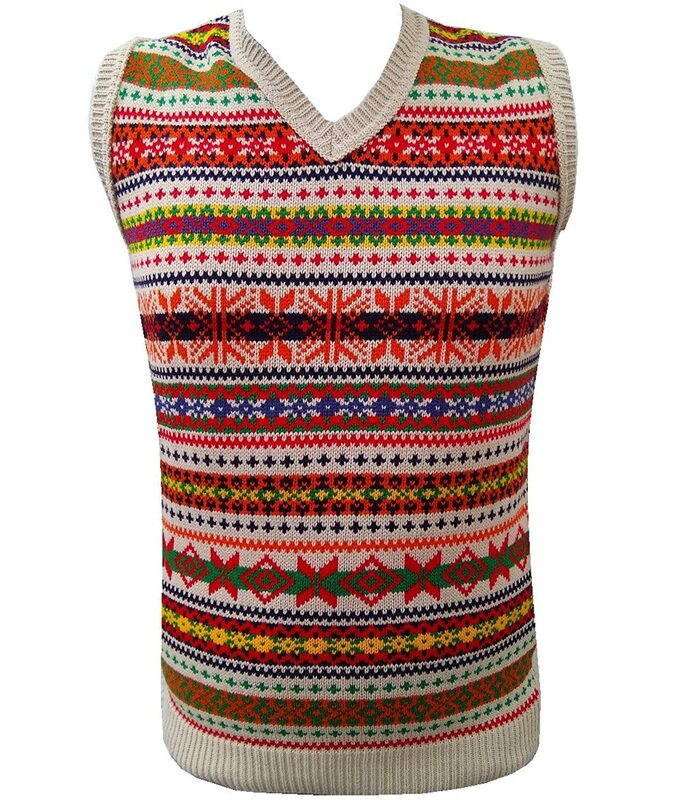 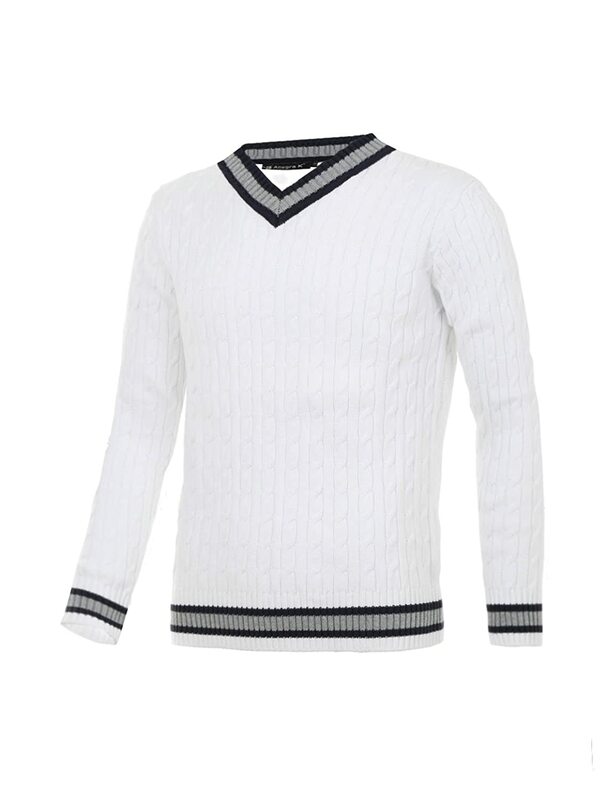 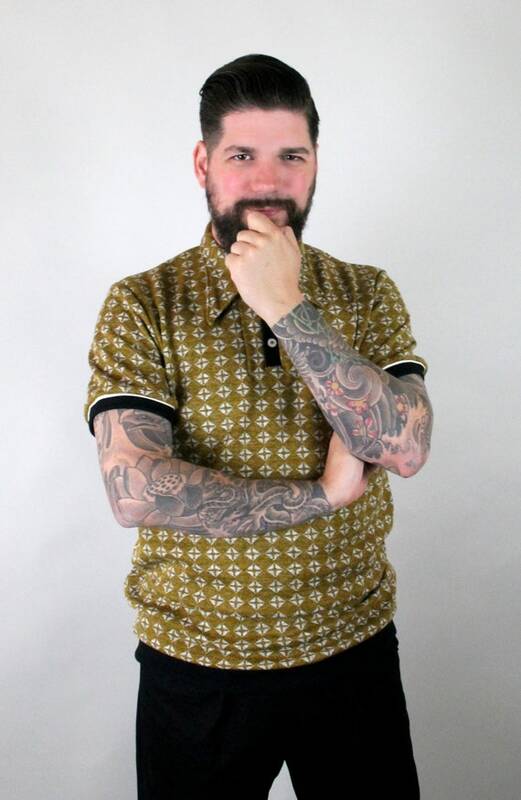 Shop vintage inspired 1940s men’s shirts, sweaters (jumpers) and sweater vests below. 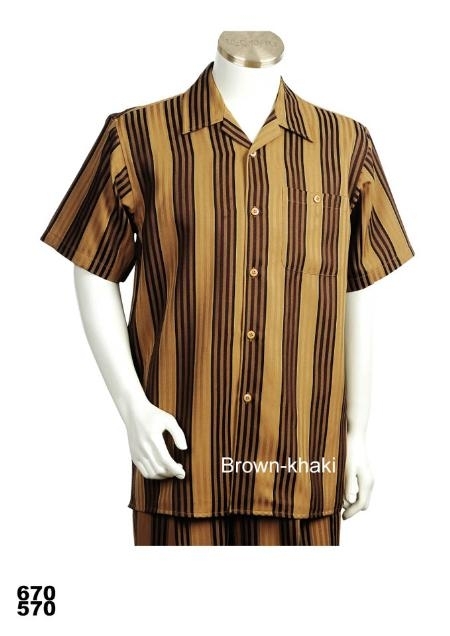 See pictures of vintage 40s men’s shirts and sweater at the end of the page. 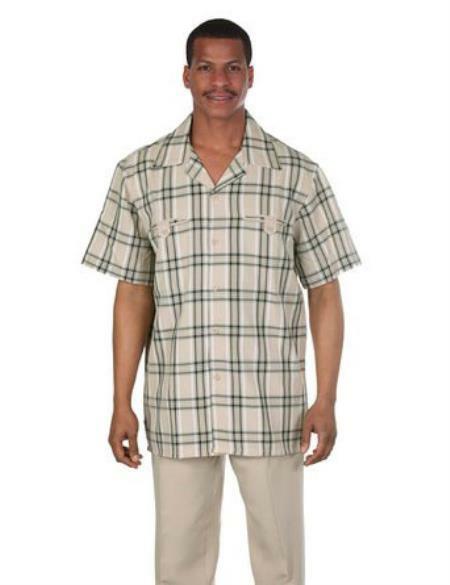 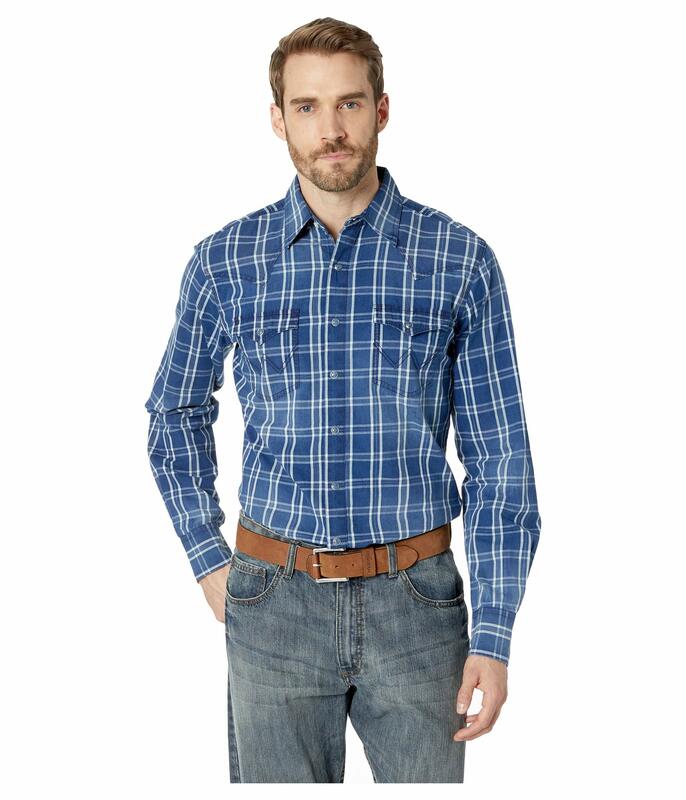 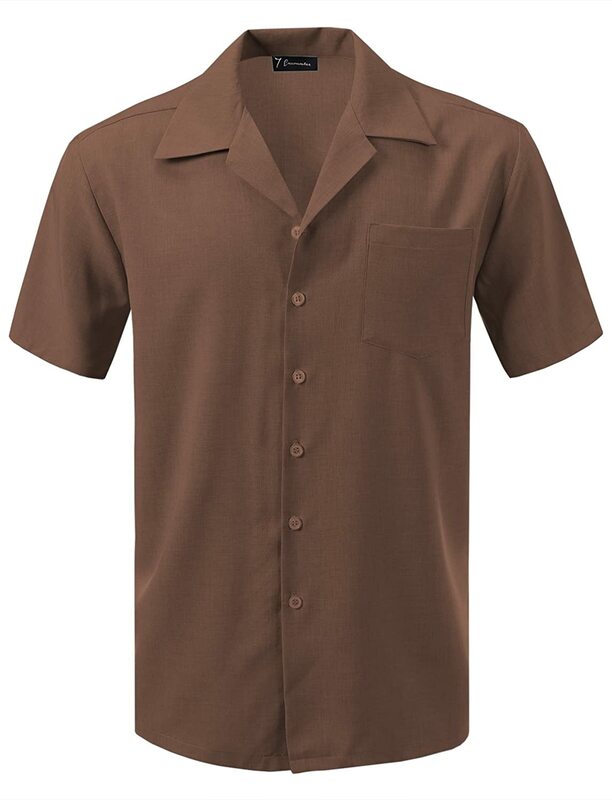 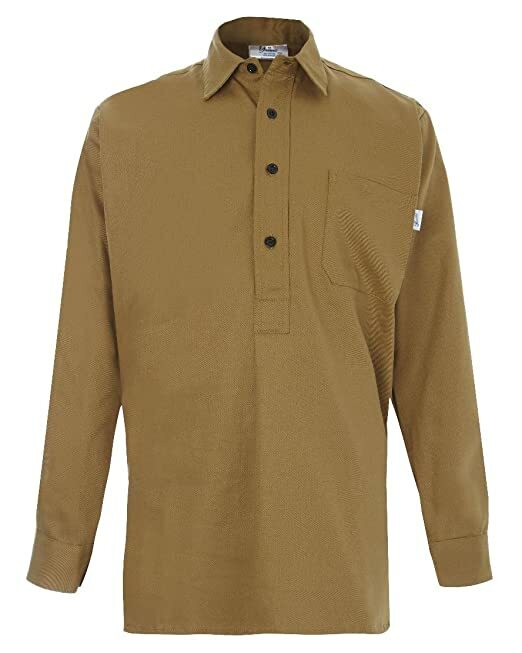 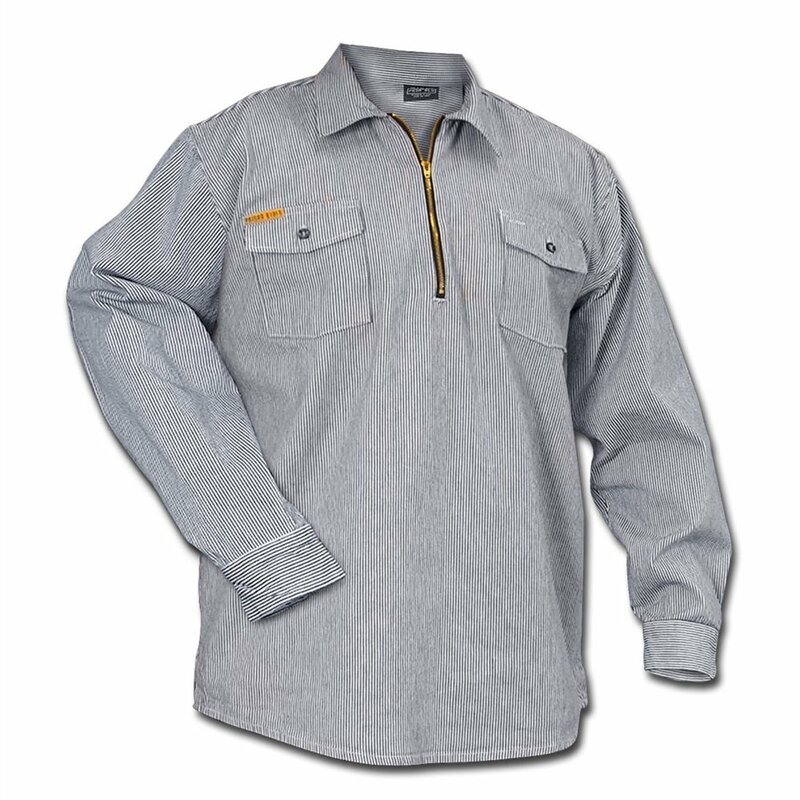 1942-43 Men’s work shirts in plaid twill cotton or cotton suede. 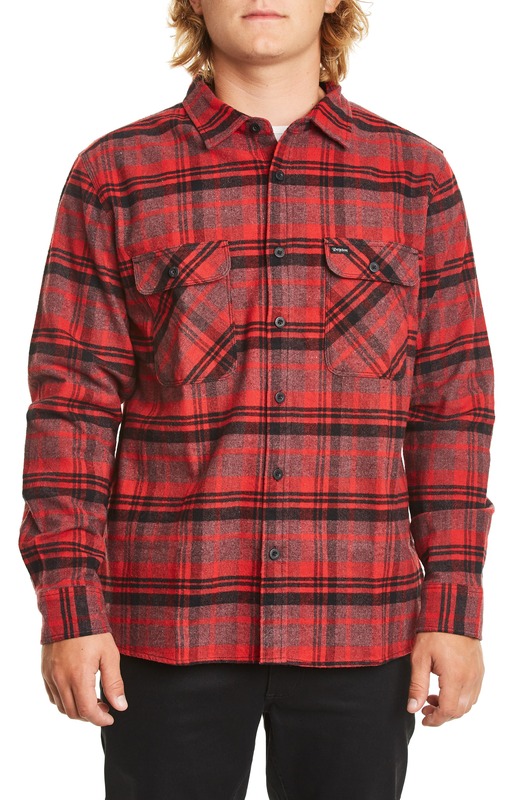 New materials in shirt and jacket styles.